Bone marrow environments are composed of multiple cell types, most of which are thought to be derived from mesenchymal stem cells. In mouse bone marrow, stromal cells with CD45− Tie2− CD90− CD51+ CD105+ phenotype, Nestin-GFP+, CXCL12-abundant reticular (CAR) cells, PDGFRα+ Sca-1+ or CD51+ PDGFRα+, and Prx-1-derived CD45− Ter119− PDGFRα+ Sca-1+ populations select for MSC activity. There is evidence that these stromal cell populations display some significant overlap with each other and comprise important cellular constituents of the hematopoietic stem cell niche. Moreover, these mesenchymal cell populations share characteristics in their location as they all are found around bone marrow vessels (can be called “pericytes”). 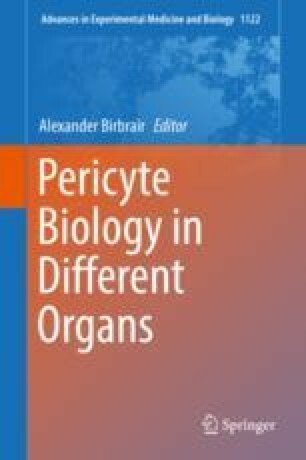 In this chapter, with reviewing the recent literatures, how the pericytes relate to physiological and pathological hematopoiesis is argued.